Red Sonja/Conan #3 is a truly awful comic book. And yet, it is the strongest chapter of this mini-series to date. It would be unfair to say that this follow-up to the excellent Conan/Red Sonja series by Jim Zub and Gail Simone has gone off the rails. This book was never put on the rails in the first place! The artwork by Roberto Castro somehow manages to look sketchy and unfinished while somehow being over-inked. His characters are misshapen hunks of random muscles, save for Red Sonja herself, who looks more like a bikini model than a warrior woman. The one nice thing I can say is that, unlike the previous issues, Castro remembered to draw bra the straps of Sonja's costume this month. The script by Victor Gischler reads like the sort of story Roy Thomas might have written back in the 1970s when he was racing to meet a deadline... and hungover. The humor and romance of the earlier mini-series is completely absent. It's the worst kind of generic sword-and-sorcery with the focus firmly on Conan and Sonja reduced to the role of a sidekick. Ignoring this, Sonja seems horribly out of character. 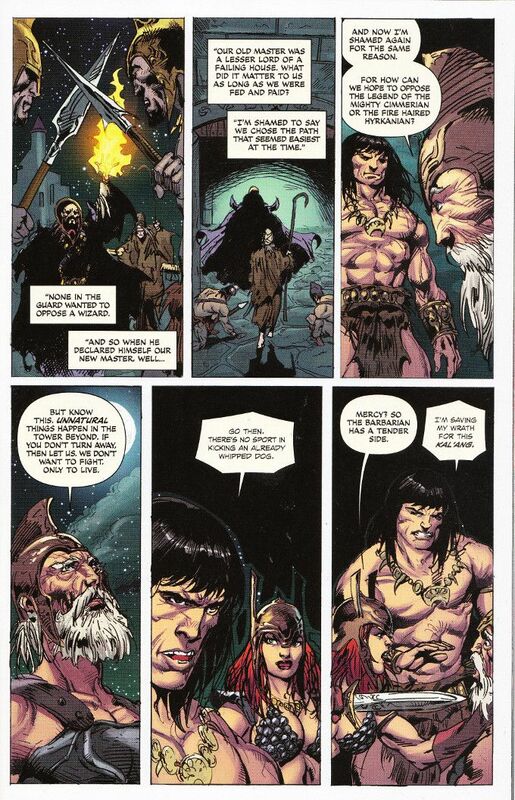 She is seemingly surprised at Conan's sense of honor when he refuses to kill a man who surrendered. Later, she suggests that she and Conan could just not get involved as they prepare to storm the evil wizard's lair but then says she expected nothing less when Conan refuses to abandon their quest. Sonja is not one to waste words thus when there is evil that needs smiting. Indeed, she has a better track record of being more hero than mercenary than Conan.